The whole point of this idiotic movie hinges on whether Aayush Sharma who wants to act can act. Unless a singular dazed expression qualifies as talent, not by a long shot.There’s more effort gone in setting his hair than his ability to emote. His pretty co-star Warina complements his vacuousness in equal measure. 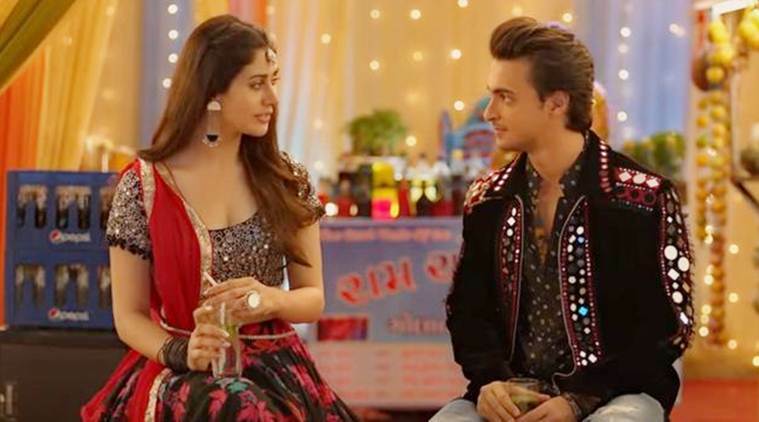 Bottomline: LoveRatri or LoveYatri, a lousy movie by any name is still a lousy movie. Sushrut aka Susu (Sharma) is a Vadodara-based lad whose dream is to start how own ‘garba’ school. He loses his heart to pretty NRI Michelle aka Manisha (Hussain), and we are steered lamely towards the oldest conflict in the book: poor amiable boy, rich ambitious girl, and of course the twain will meet after two and half dreary clichéd hours. It’s evident that Aayush and Warina are raw, but both have a charming screen presence with enough chemistry. Since the story requires them to be innocent and naïve young lovers, this inexperience works in their favour. Ayush’s boyish appeal is likeable, although his first film doesn’t give him a chance to show much range as an actor. Ronit Roy as Michelle’s father and Ram Kapoor as Susu’s uncle, lead the charge to handle the emotionally heavier dialogues and scenes. Although ‘LoveYatri’ lacks the gripping appeal of more contemporary romantic stories, it might be just enough to satiate die-hard romantics looking to revisit the love stories of the 90s. this film is a litany of dour cliches. When the chips are down for him, the hero is exhorted to emulate the male protagonists of Qayamat Se Qayamat Tak, Veer-Zaara and Tere Naam and fight tooth and nail for the woman he loves. Go, get the girl, revellers in the aforementioned bar roar in unison. The guy is re-energised. No wonder everything that the besotted young man does or says from here on, and at several other points of the film, is insufferably vacuous. Niren Bhatt’s story is too simplistic. There are a lot of interesting characters and even the setting is unique. But the writer doesn’t use them well. The biggest conflict arising between the lovers is insignificant but it takes forever for the misunderstanding to resolve. Niren Bhatt’s screenplay however is engaging and entertaining. Despite the fact that there aren’t many conflicts happening in the film, the script keeps viewers engaged. Niren Bhatt’s dialogues are quite nice. Some of them might remind of the WhatsApp forwards but considering the context and theme, it works.On the whole, LOVEYATRI is a feel good and colourful film laced with some lovely moments and chartbuster music as its USP. It’s a clean entertainer and has the potential to attract youth and families in abundance! Niren Bhatt’s script is old wine in recycled bottles, just with a new faces and a new setting. From the backdrop of the Navratri festival in Vadodara, the action later shifts to the banks of the River Thames in London. Boy chases girl, proves his worth to the unreasonable father, wins girl, and meets two sympathetic Gujarati policeman who become his unlikely saviours (Arbaaz Khan and Sohail Khan).